There are still many opportunities to beat the ‘big boys’. Google looks at your website, not the size of your business. What is Organic/Natural Listing and is it important? Getting your website to the top of Google Search for a specific phrase is considered by many to be the Holy Grail as far as SEO goes. 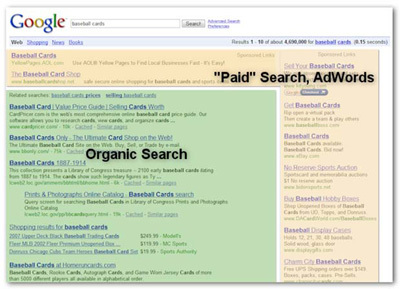 An Organic (or Natural) listing is a term used to refer to the links that are “not paid” for. See the Google screenshot above. The ‘paid’ ads are found on the right hand side and sometimes at the very top. The main area (shown in green) is the area you can occupy without paying for the privilege. This is the area you aim for with top organic SEO. You can show at ‘the top’ of Google for your search phrases by adopting a PayPerClick (PPC) campaign using Google AdWords, or you can get there in the ‘organic’ section without paying anyone for the click to your website. In some circumstances PPC can form an entirely appropriate piece of your marketing strategy, and we manage PPC campaigns for many clients. Here however we will discuss how to get to the top ‘organically’. SEO is a series of techniques used off-page and on-page to make it search engine ‘friendly’. A search engine ‘friendly’ website is more likely to achieve a high ranking in the ‘organic’ search, without having to pay to get there. To increase ‘traffic’ to your website your link needs to show up in a high position on a Google search for the keywords that suit you. These are words that your potential clients might use to search for a company that provides the service or products that you do. What are the best keywords for my business, and how do I use them? Like every other marketing technique, it is down to research. You probably have a ‘pretty good idea’ what keywords your clients and prospects use to find you, but do you ‘actually know’? Also, what do your competitors use, and how many competitors are there for specific keywords? Doing this research correctly at the outset allows you to have the right information, without this you don’t have an informed view of the planning process. How long will it take search engines to index my new website? In our experience it can take anything from 1-6 months for Google to fully index a new site. By “new” we mean a site that has not been “live” on the Internet before with more than just a holding page. However, most of our sites are indexed on the first day of the launch. If you have an existing site that is redesigned, then Google will be used to coming to your site and “spidering” it and the comments above do not necessarily apply. Right away, do the research, even if you don’t have a website yet. SEO is something that is not going away, and if you are not optimising your website well enough, your competition will get your business. And I’ll tell you something else too, there are still many opportunities to beat the ‘big boys’; the days of being complacent because of size are over. Flow Online, organic SEO company from Bristol, UK helps you find internet solutions to grow your business. I hope that knowing better what organic SEO is, you’ll contact us now and I will give you analysis on your website and your SEO search engine marketing with no obligation.